Set some ten years after Alice's first trip to Wonderland, Alice finds herself being forced into an arranged marriage. Seeking an escape, Alice finds herself back in Wonderland with familiar faces ready to help her. Although this time, Wonderland needs Alice to help in dethroning the evil Red Queen and her reign of terror. It is very hard with a iconic property like "Alice in Wonderland" to appease everyone. There are fans from all around the world who have long cherished Lewis Carroll's stories, not to mention the 1951 Walt Disney cartoon. It goes without saying that Tim Burton and Walt Disney had some big shoes to fill. Unfortunately, Tim Burton's "Alice in Wonderland" is painfully hit and miss. I am a huge Burton fan and have long hoped for him to return to form. Outside of his 2003 effort Big Fish, I have yet to fall in love with a Burton story since 1996's Mars Attacks!. Films like Sweeney Todd: The Demon Barber of Fleet Street, Corpse Bride, Charlie and the Chocolate Factory, Planet of the Apes and even Sleepy Hollow end up feeling uninspired and like Burton is just going through the motions. 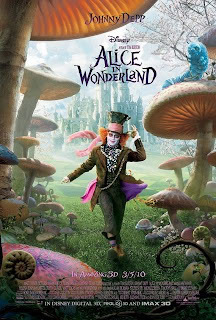 Here in 'Wonderland' Burton doesn't feel like he is just going through the motions, but in more ways held back from giving us a true Burton experience. The film teeters the line in strange, but never quite goes all the way. It felt as though Burton was restricted by Disney with how dark and strange he could take Wonderland. I really wanted things to get weirder. Every time it seemed Burton would take us over the edge, he would retreat instead. Don't get me wrong, visually Wonderland looks immaculate, but the tone is ultimately geared towards kids. Especially the 15 and younger crowd. Staying focused on "Alice in Wonderland" being geared towards kids for a moment. The storyline of the film reminds me of the Nickelodeon toddler show Dora the Explorer. The audience is given everything they need to know within the first 15 minutes of the film. I seriously was waiting for the Mad Hatter to break the fourth wall and ask the crowd, "Where are we going?" The movie quickly divulges the entire dilemma and gives a solution all within the same scene. Absolutely nothing is left up to the imagination. This becomes a huge turn off in retrospect. I want wonderment and illusion in Wonderland. Hell, I want to be a little scared, I mean we are talking about a land where animals talk and flowers sing. I don't want to be told the entire plot in the first act, leaving no twists to play out in the final two acts. The decision to spoon feed the crowd the entire plot to "Alice in Wonderland" also creates another problem with the 108 minute film, it lags. The movie suffers from one too many lulls, where we are forced to sit and watch Alice debate. Even though she knows exactly what to do, Burton torments us with her childlike indecision. Luckily the 3D and visuals all help to ease the pain of any pitfalls in "Alice in Wonderland." Well except for one scene in particular including the Mad Hatter near the end that had me covering me eyes in disappointment. The film does not rely on 3D gags with stuff jumping off the screen, but instead builds a rich and layered world. I loved the look. There were of course, a few things that were distracting, but I think they were meant to come across that way. It was those awkward things that reminded me of the old Tim Burton I use to love so much. The performances were also fairly hit or miss. I really enjoyed Helena Bonham Carter (Red Queen), Crispin Glover (Knaves of Hearts) and Stephen Fry (Cheshire Cat) but wasn't so delighted with Matt Lucas (Tweedledee/Tweedledum), Anne Hathaway (White Queen) or Mia Wasikowska (Alice). Alan Rickman was awesome in a very brief role as the Caterpillar as was Christopher Lee as the Jabberwocky. I might be in the minority on Johnny Depp, but I thought he brought nothing new to the role. His look was awesome and he was fun to watch on screen, but in the end, his performance felt phoned in. Overall "Alice in Wonderland" is fun. There isn't enough to make it an awful movie, but there is equally not enough to make it a good one. The score feels very retread by Burton's longtime associate Danny Elfman and didn't help to whisk me into Wonderland at all. At the end of the film, I looked to my kids reactions. They were very enthusiastic. They ate up the fantasy adventure just as Burton and Disney prescribed. Seeing their reactions leads me to believe for kids, "Alice in Wonderland" is a fun filled fantasy adventure. What it isn't is a film for die hard Tim Burton and Alice in Wonderland fans. The film is better served as if you had little no knowledge of Burton's previous work.